I love reading articles about the health benefits of different types of food and so I decided to create a post about my favorite fruit! Bananas are not only a delicious fruit but they are packed with a wide range of health benefits. Bananas are definitely a heart healthy food because they contain vital nutrients such as fiber, potassium, and vitamins C and B6. Bananas also maintain heart health because they help lower the blood pressure of those who suffer from high blood pressure. 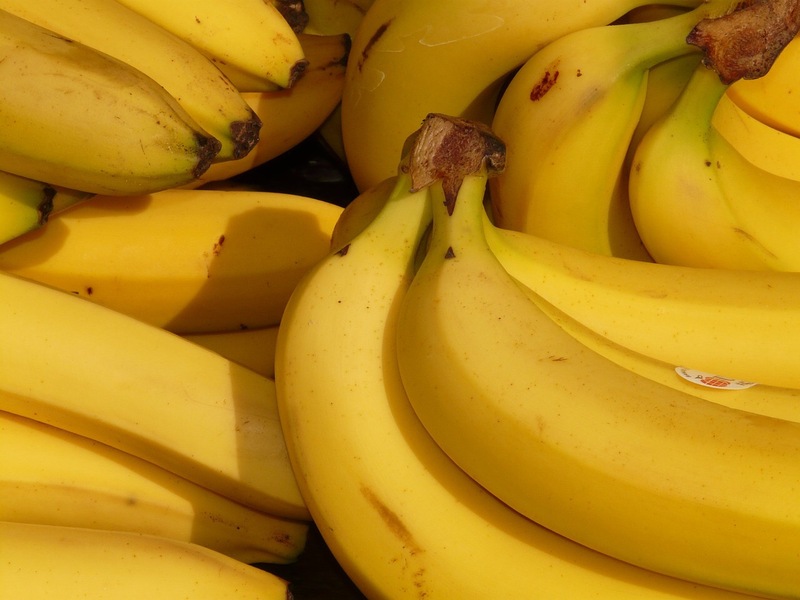 Bananas can reduce the chance of a child developing asthma. In fact, the results of a study conducted by the Imperial College of London showed that children who ate one banana a day had a 34 percent less chance of developing asthma. Also, research has shown that children who ate bananas (along with oranges and orange juice) had a reduced risk of developing childhood leukemia. Even in adults, bananas can reduce the risk of developing certain cancers thanks to its Vitamin C levels which help to reduce damage from free radicals. Also, since bananas have a high amount of fiber they can reduce ones chance of developing colorectal cancer. A common myth about bananas in my family was that bananas make you fat. The reality is that bananas by themselves don’t make you fat and they likely won’t make you lose weight either. However, bananas do have quite a bit of fiber and it has been shown that a diet with high fiber can aid in weight loss. Bananas are an excellent snack to have before, during, or after excercise. Bananas are high in glucose which means they will give you the energy you need to get through an intensive workout especially a cardio workout. Thanks to its magnesium, bananas can help prevent or relieve muscle cramps or soreness. The magnesium in bananas leads to protein synthesis which can help increase your lean muscle mass. Thanks to its potassium, bananas can help you workout longer and more easily recover from an intense workout. Additionally, bananas have a high amount of choline which is a form of Vitamin B that helps burn fat. The recommended daily intake of potassium is currently set at 4,700 milligrams. However, studies show that the majority of Americans don’t get the recommended daily amount of potassium. Bananas are definitely a good source of potassium and the average banana has around 420 milligrams of potassium. Potassium aids in our overall health by maintaining fluid levels in our body. Potassium is vital for cell health because it regulates the movement of nutrients and waste products in and out of our cells. Bananas aid in digestion thanks to their non digestible carbohydrates which helps maintain a healthy gut. Due to its unique combination of nutrients such as fiber and a cluster of fruit molecules bananas help make you more regular and they even help those suffering from diarrhea. Thanks to its potassium bananas are also helpful in maintaining healthy kidneys. Research has shown that people who eat bananas four to six times a week have a 50 percent reduced chance of developing kidney disease compared to those who don’t eat bananas. However, as a word of caution other research has shown that if you do have kidney disease it is best to eat bananas n moderation because too much potassium can worsen kidney disease. Bananas have folate which can be beneficial to those suffering from depression. Studies have shown that many people who suffer from depression have a higher risk of having folate deficiency. If your taking an antidepressant it is recommended to continue eating bananas because folate can help enhance the results of the medication. Bananas also have tryptophan which leads to seratonin. This means that bananas can potentially help reduce some of the stress and anxiety that you may be going through and put you in a better mood. Also, thanks to tryptophan bananas can also help you get a better night of sleep. Here in the United States bananas are among the most popular fruits even more so than apples and oranges and in my personal experience they are pretty inexpensive as well. If you’re lazy like me, the great thing about bananas is that you can easily peel them and enjoy the tasty and healthy treat. Of course, there are many different ways you can include bananas in your diet and although I always throw the peel away, while I was doing reeearch for this post, I have learned that in many cultures the banana peel is used in cooking as well. The banana peel has numerous benefits as well. Some of these benefits include using the peel for beauty purposes such as removing pimples and alleviating wrinkles. As I mentioned the banana peel can be used for pimples. I learned this trick from a YouTube video by Huda Kattan of Huda Beauty. She explained that its best to eat the banana when it’s ripe and keep the peel overnight until it’s very dark and then cut it into smaller pieces (just to make it easier to use) and rub it on your pimples. Continue to do this for a few days until all pimples are gone or until you see improvement. Other bloggers have mentioned that rubbing the banana peel on your skin may help with wrinkles as well. Due to its high water content and Vitamin A eating bananas regularly can be beneficial to your skins overall health. Finally you can add bananas to your face mask. The truth is that both unripe and ripe bananas have their own pros and cons. Unripe bananas are the ones that are green. Unripe bananas have a high amount of resistant starch and they’re not that sweet so they’re better for people with Type 2 diabetes because of their low glycemic index. Unripe bananas are also better for colon health thanks to a specific probiotic bacteria that they have. Unripe bananas are better for absorbing nutrients. On the other hand the antioxidants of the banana increase as it ripens so unripe bananas have a lower amount of antioxidants. Also since unripe bananas have a higher resistant starch content they can cause some extra bloating and gas. Ripe bananas are easier to digest thanks to their higher sugar content and ripe bananas have more antioxidants. Research has shown that ripe bananas can help protect you from cancer because they fight abnormal cells in your body. On the other hand, ripe bananas lose some of their vitamins and minerals. Also, ripe bananas do have a higher sugar content so they are not ideal for those who suffer from Type 2 Diabetes. I hope you enjoyed this post hopefully it has encouraged you to reach for a banana the next time you’re hungry! Following a nasty health issue bananas (and yes chocolate) were actually recommended to me by my doctor as they are both great sources of potassium. As fast as I buy bananas however, they are eaten. I usually buy them slightly green as at least that way I get to enjoy looking at them for a few days. I remember travelling on the Trans-Siberian railway and seeing a seller who was selling bananas in the middle of Siberia. They had been very expensive. We had a tropical storm here which had almost wiped out the entire banana crop. We had not been able to afford bananas for several months. I still remember our relief as the price had started to come down. I never take bananas for granted. Thank you so much for the lovely comment and for sharing this very interesting story. After reading your comment I am happy that bananas are no longer so expensive in your area and I am definitely grateful that they’re so inexpensive in my area. I live in very warm Southern California and so I also make sure that the bananas are very green when I buy them because they ripen very fast here! I slice them and keep them in the freezer then pop them in yogurt. Here in Florida they go bad so fast so this is a great way to keep them longer, plus it makes the (vegan) yogurt taste like ice cream. 🙂 Plus you can just take a slice out of the freezer and eat it like a piece of candy too! What a great idea!!! Thank you for sharing this great tip I look forward to trying this! I want to thank you for your efforts to make everybody’s life”a bit better”. It is a lovely idea and your support of my blog has meant a lot to me. Thank you. Thank you so much for your very sweet comment!😊 Your most welcome and I truly enjoy reading your blog! Thank you for always supporting my blog as well! Bananas are everything to me. delicious and healthy!